Inside the Megalopolis: Tabasco Ignored in U.S.
People trapped on rooftops, looting and dehydrated victims--sound familiar? The comparisons between Katrina and the flooding of Tabasco--a gulf coast state in eastern Mexico are eery. About 80% of the entire state is under water, and this tragedy is being described as one of the worst disasters in modern Mexican history. Yet, there seems to be little interest about this horrible situation in the U.S. print media. Several major newspapers--including papers we work for-- have decided to publish short Associated Press stories or a brief, if at all. If this tragedy would have occurred in Acapulco or Cozumel, people in the U.S. would probably be sick of hearing about it at this point. Today, I joined hundreds of other volunteers at the Red Cross headquarters in Mexico City to pack up items such as diapers and canned food for the flood victims. The scene at the Red Cross was both chaotic and inspiring. 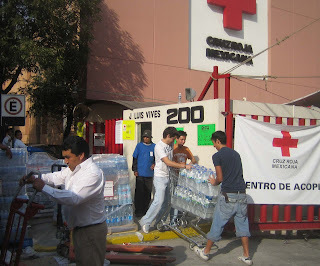 Many Mexican employers gave their employees the day off to go volunteer. Children, still in their school uniform, came directly to volunteer after school. I spent most of the time preparing kits for babies, with everything from bottles to diaper rash cream. 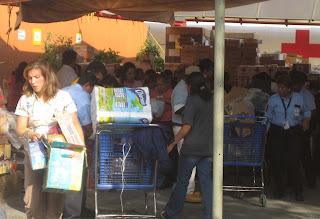 Click on the blog title to read more about the situation in Tabasco. Volunteers dashed from one place to the other as more and more donations kept coming in, making it a hectic scene.